TREVOR CULLEN HAD almost abandoned his dream of owning his own Ferris wheel by the time he met Tom Head in the middle of a field outside Cincinnati, Ohio. Stood next to the 6ft 8″ former basketball player, was a generator attached to a 55ft Ferris wheel. “Ten minutes later I was going around on it,” says Cullen, who’d spent the best part of a year back and forth to the USA in search of his own carnival attraction. Growing up, Cullen’s parents ran a travelling cinema, performed in circuses and then at carnivals. Cullen set up a small advertising company but after the economic crash returned to his roots, establishing his own fairground. He started with a Hobby Horse. “I went for nostalgia. I wanted a real traditional fairground. But the thing that I was always yearning for was a Ferris wheel. A real Ferris wheel. Cullen went online, contacted a man on Coney Island – the famous amusement park in New York City – who was selling his Ferris wheel and purchased a plane ticket. After weeks traipsing across the States, Cullen eventually arrived to meet Tom Head, an “extremely eccentric” former basketball player and English lecturer who happened to own what he claims is the original Ferris wheel from the musical Grease. Starring Olivia Newton-John and John Travolta, Grease was hit when it was released in June 1978. Following the final high school days of a group of teenagers, the musical featured the hits “Summer Nights”, “Greased Lightin” and “You’re the One That I Want”. 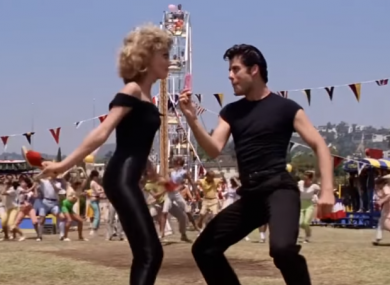 It’s during the film’s final scenes – when Danny Zuko (Travolta) and Sandy Olsson (Newton-John) dance through a school carnival – when Head’s Ferris wheel appears. The cast, who had been rehearsing the final number for weeks, did not realise until they arrived on set that Producer Allan Carr had rented an actual, fully-operational carnival. The 55-foot Ferris wheel was reportedly built by the Eli Bridge Company in 1958. They’ve been constructing Ferris wheels in Jacksonville, Illinois for over 100 years, according to a company spokesperson. Haggling on the price, Cullen eventually struck a deal with Head for his Ferris wheel after seven months. He flew back to New York to pay Head, who was driving from Cincinnati. The pair had arranged to transport Cullen’s newly acquired Ferris wheel from New York to Liverpool and then to Dublin. Head never showed for their meeting, though. We had a screaming row. Then out of nowhere the next day he dropped the Ferris wheel to the docks. Cullen finally had his Ferris wheel and arranged for Head to fly to Dublin to assemble the fairground attraction, said to have appeared in Grease. “It looks the exact same,” says Cullen. The company can’t confirm if this Ferris wheel is, in fact, the original that appeared in Grease. Cullen and Head eventually managed to re-assemble the Ferris wheel. In a string of hitches, Head couldn’t remember how to re-assemble the fairground attraction when he visited Dublin. The Cincinnati man finally took his payment from Cullen and the pair have remained friends since. Now at the Dún Laoghaire Christmas Festival, visitors can take a spin on the Ferris wheel which made its way from Cincinnati to Dublin and which is said to have appeared all those years ago at Rydell High. The festival runs until 23 December, Cullen’s Ferris wheel in place at Moran Park until 2 January. Email “Did the Ferris wheel from Grease make its way from Cincinnati to Dún Laoghaire?”. Feedback on “Did the Ferris wheel from Grease make its way from Cincinnati to Dún Laoghaire?”.